A resident who spoke on condition of anonymity said: "There are a number of radical Muslims in the area, some of whom are extremists. But most of the Muslims here are moderates." Her family, however, told Crime Line that she was active on social media. One of her last tweets, posted in 2012 read: "When Muslims are massacred daily, it's nothing, as soon as one Jew is killed, the whole world wants 'justice' i#PrayForGaza." ...Some reports suggest that up to 200 South Africans have been recruited. In February, The Times reported the UN Security Council's warning that about 11 international terrorists were considering using South Africa as a base. The UN said the 11 were linked to al-Qaeda and IS. Muslim Judicial Council spokesman Nabeweya Malick worried about teens falling prey to IS. "We need to find out who is involved." Indeed we do. But not everyone sees it as a major concern. 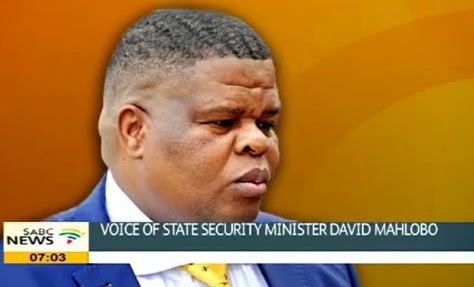 State Security Minister David Mahlobo has assured South Africans that they are safe from any form of terrorism. This after a 15-year-old school girl from Cape Town was taken off a flight to Johannesburg by police who suspected that she was going to board an international flight to join the Islamic State... He says terrorism is a worldwide problem, but security officials in the country are working tirelessly to ensure the safety of South Africans. "It doesn’t mean there are terrorists in South Africa, but the use of social networks and technology is a challenge. They are using technology to attract children. But we know our security cluster officials in this country are working tirelessly to ensure our people are safe. People must calm down. There are no terrorists in the country." Actually the minister says much more in the video version of the interview embedded below. The interviewer points out, before turning to the minister, that it's clear ISIS's recruitment drive is extensive, South Africa is not immune and the terrorists are making real inroads. What do we know, she asks reasonably, about the modus operandi of these people? How prevalent is recruitment in South Africa? If it can reach a fifteen year-old, there must be face-to-face interaction, she says. If a youngster is going to travel by plane, there must have been an adult in the story. Not so, says the politician. "They are trying to recruit people without putting their foot in the country." He says it's all about what he calls "access to gadgets and technology... Our biggest challenge is cyberspace... social platforms... The state alone cannot deal with this alone; we need the support of the parents... Let's not be more overstating the issue... They are trying to work on the minds of unsuspecting young people... the vulnerabilities of various communities in terms of unemployment, inequalities... using ideology for one reason or another..."
We don't know South Africa well. But we take off our hat to the self-confident Minister of State Security and his ability to explain the hottest story of today without once mentioning Islam, Islamism, or jihad. Nor does he refer to South African media reports from February 2015 ["Is this the first South African fighting for the ISIS? ", Daily Maverick, February 22, 2015] profiling Abu Hurayra Al-Afriki who also "refers to himself as al-Hindi, ‘the Indian’, suggesting that he is a South African of Indian origin" [source]. As for whether the South African security apparatus is going to find practitioners, promoters and/or recruiters actively serving the terrorist cause, this might be hard to do if the agents know success will mean contradicting the brash senior politician in charge of their careers. Just a question... why was the girl "who may not be named" tweet quoted directly? This will allow anyone with access to google, to just search for the tweet which will then expose her identity?